More than 1,000 municipalities, airports, military bases, private security firms, emergency response teams, and other public and private safety organizations can't be wrong. They've all stepped up to the Segway® Personal Transporter (PT) for patrolling. They're connecting more with the communities they serve. They're keeping people safer. They're responding to emergencies more quickly. They're preventing crime. And they're doing so all while creating fewer emissions, taking up less space, and a lot less hassle than other transportation options. For the multitude of private organizations using Segway® PTs to patrol and respond to emergencies, the Segway® PT is a force multiplier. They can put a guard out on a Segway® PT and the public feels like there's more of a security presence. It's part psychological, its part fact. Someone patrolling atop a Segway® PT can see above the crowds and be seen. The rider is noticed and that translates into fewer car break-ins and lives saved because emergency equipment was able to be brought to a patient in need. Whether you're a local fire department or event medicine, you'll find Segway PTs to be an invaluable transportation tool for all of your EMS needs. 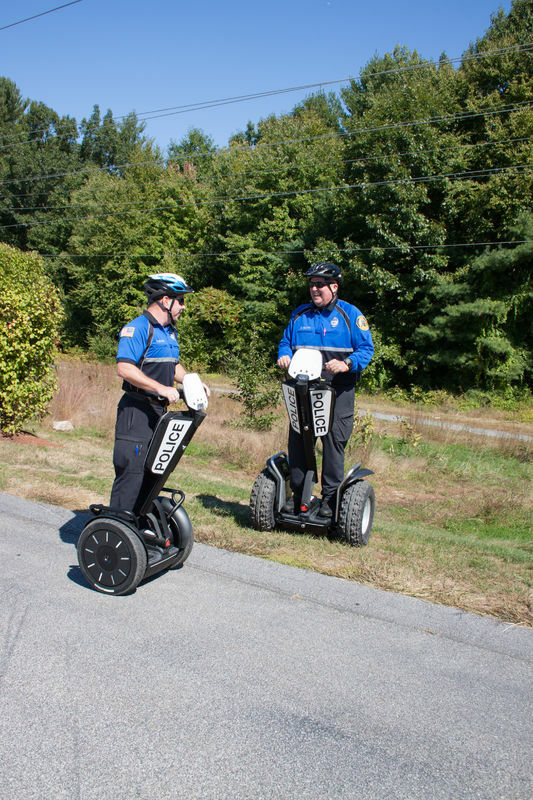 The Segway® Patroller i2 and x2 models were designed with the direct input of trusted law enforcement and security professionals. Their recommendations informed high visibility, integrated lighting systems, durable components, surfaces for insignia, stowage area, and other enhancements. From the wristband for the InfoKey controller to the improved bumper, the Segway Patroller was built with the patrolling officer in mind. Have specific needs? There are a number of cargo, lighting and other accessory options available from Segway. Segway® Inc. is pleased to offer municipalities, federal agencies, and security organizations attractive low payment financing options in the United States. Read below for more information on Segway® PT financing solutions for patrol environments. Don't wait, request more information today! Segway® Inc. is proud to offer municipalities the opportunity to lease to own a new Segway PT for zero money down*! Leasing to own provides municipalities all that the Segway® PT has to offer while keeping money on hand for incidental expenditures. With only an order minimum of only two units, zero money down and a 36-month term there is little reason not to outfit your fleet with Segway® PTs today! Also, all leasing options include an extended warranty for the life of the lease! Organizations are looking to optimize the productivity and performance of their manned guard services even while budgets shrink. Segway® is proud to offer private security businesses the opportunity to lease Segway® PTs. With a minimum order of only two units and a 36 month term, well-qualified organizations can be paying as low as $199 a month*. Also, all leasing options include an extended warranty for the life of the lease! For more information about financing and beginning the application process, please contact us. Want to try out a Segway and see the sites and sounds of Nashville? Book a tour with us!